Over on the EntrepreneurProvidence blog, I’ve been tracking down all the exciting new construction projects underway throughout Rhode Island and explaining what’s being built. 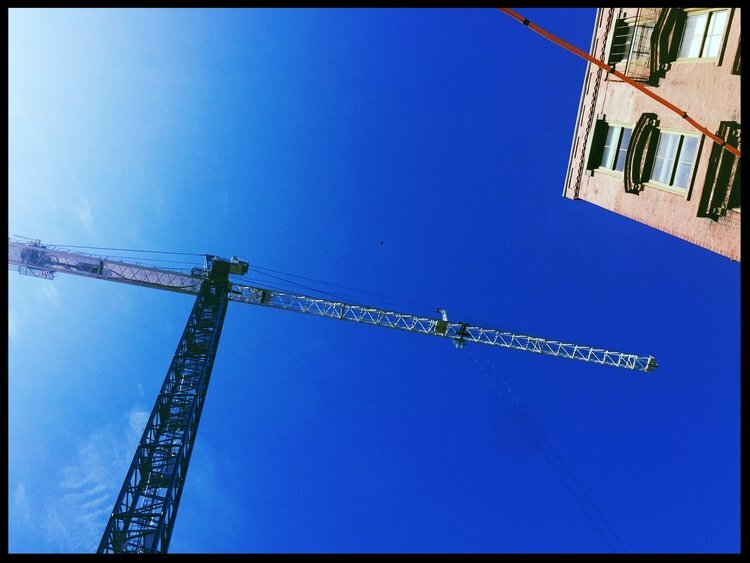 Whether we’ll call the blog series “Crane Spotting” or “Cranes in the Sky” or “Crane Watch,” we haven’t decided yet; I’m still getting used to Providence’s new #Cranetown nickname—and to a skyline brimming with these symbols of good things to come. Today, I want to share some of the stories surrounding these projects. Their common denominator: None of them would be occurring if investors weren’t confident that the economy in Rhode Island is on the upswing, in part thanks to the incentives put in place by the Raimondo administration with the support of the General Assembly. With last month’s groundbreaking on the former Route 195 land, business, academic and government leaders are partnering with Wexford Science and Technology to create a grand Innovation Center that will be at forefront of discovery. The center will be anchored by Brown University, the Cambridge Innovation Center (CIC) and Johnson & Johnson. In addition to the 66,000 square feet in the Innovation Complex, CIC is also planning to locate an 8,000-square-foot Innovation Hall and Venture Café—dedicated civic spaces that are modeled after CIC’s highly successful District Hall in the Seaport District of Boston, where the innovation community can gather and exchange ideas. It’s been about a year since Rhode Island voters bullishly approved Phase II funding to create a gleaming new complex for URI’s College of Engineering—a $125-million endeavor designed to put our state’s flagship research institution at the vanguard, internationally, for engineering and entrepreneurial prowess. The demolition of five antiquated buildings began in the spring and was completed this summer. Eager to see how the project is shaping up, I recently headed over to campus to take a closer look and was thrilled to see teams of construction workers moving earth, burying conduit and pouring concrete—laying the metaphorical groundwork for the jobs of the future. Ballinger of Philadelphia is the prime architect, mechanical engineer, electrical engineer, and structural engineer on the project, and the associate architectural firm is Chamber member DBVW of Providence. The construction management firm is Dimeo Construction Co. of Providence. DBVW Architects is also working closely with Vision Properties on Edge College Hill, a new mixed-use residential project in downtown Providence at the base of College Hill. Located at 169 Canal Street, this new 15-story high-rise will include 202 micro-loft style apartments and first floor commercial space. Residents will be able to choose from views of the Providence skyline, historic College Hill and the Rhode Island State House. These modernly furnished apartments will primarily be marketed toward students. Features will include oversized windows, high-end finishes, 9’7” ceilings, fully equipped kitchens and fold-down beds that tuck into contemporary cabinetry when not in use. Formerly a surface parking lot, 169 Canal Street is a long vacant parcel of land that fronts Providence River Walk. When completed, this urban, car-free development will play an important role in fostering a more walkable and livable city. In addition to adding significantly to the number of residents living downtown, the project will encourage new businesses such as restaurants and markets to join Providence. At the confluence of Exchange Terrace, Steeple Street and Memorial Boulevard in Providence’s Capital Center District, a $20-million eight-story extended stay Homewood Suites by Hilton hotel project is beginning to go up. Its developer is First Bristol Corporation, led by veteran hotelier James Karam (who recently joined me on a Bisnow panel in Boston in celebration of Rhode Island’s economic development momentum). Karam started First Bristol 35 years ago and has built the family business into one of New England’s premier real estate development and management companies. It was selected by Hilton Hotels Worldwide as the National Developer of the Year for its Homewood Suites by Hilton Brand. The lot is uniquely compact and triangular, which necessitated design finesse and architectural creativity to ensure vibrant, street-level interaction. With 120 suites being offered, the hotel’s target market is upscale professionals who require housing for longer than a few days. The Greater Providence Chamber of Commerce has been working for many years to champion an environment in Rhode Island that leverages our amazing assets, including our comprehensive talent base, our world-class universities, colleges and hospitals and our innovative businesses. With the added support of Governor Raimondo and her administration, we are confident that progress is accelerating at a rapid pace now.